With the Bruins and Maple Leafs on a collision course for another first round playoff showdown, Brad Marchand says the team isn't worrying about who they will face when the postseason gets underway, but explains why he doesn't really think the current playoff format is fair. 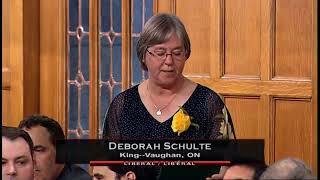 Added March 14, 2019 from Deb Schulte MP. Added March 1, 2019 from Deb Schulte MP. 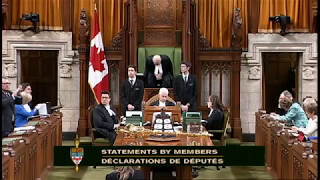 Today I rose in the House to celebrate Black History Month and International Women's Day 2019 with a members statement. It was a privilege to host Nadine Williams (poet, writer, educator) and have her witness our democracy in action in the House of Commons. 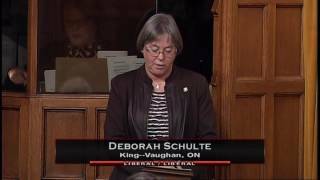 Added February 8, 2019 from Deb Schulte MP. 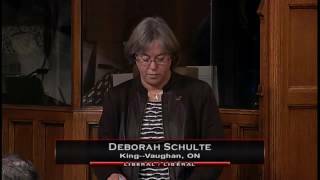 Deb rose in the house to recognize the inspiring work that her constituent, Karl Subban undertakes to encourage Canadian men to live healthier lives, as a champion of the Canadian Men’s Health Foundation campaign #DontChangeMuch campaign. 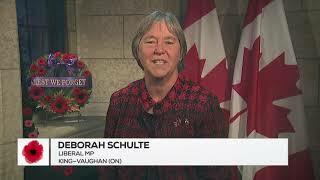 Added December 10, 2018 from Deb Schulte MP. Added November 21, 2018 from Deb Schulte MP. 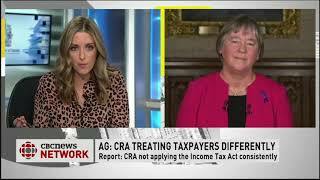 Deb discusses the Auditor General’s report of the Canada Revenue Agency on Power & Politics, and the significant steps that the government is taking to bring fairness and consistency to the Canadian tax system. 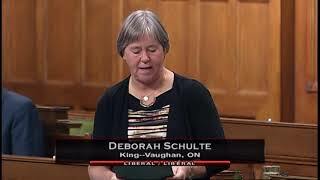 Added November 19, 2018 from Deb Schulte MP. Remembering those that fought for our freedom and peace, and those that made the ultimate sacrifice, especially on this important 100th anniversary of the Armistice. 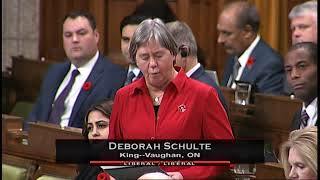 Deb rose in the House to thank the Ahmadiyya Muslim Jama'at Canada for their poppy campaign in support and respect for our veterans and troops, and for all those who paid the ultimate sacrifice to keep Canada strong & free. 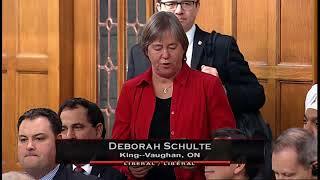 Added October 2, 2018 from Deb Schulte MP. Deb rose in the House to recognize the contributions seniors have made to building our great country. Let's all celebrate our seniors today and every day. 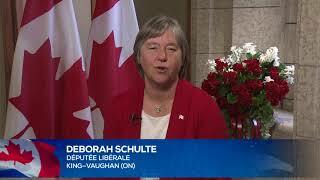 Added June 30, 2018 from Deb Schulte MP. Canada Day is right around the corner and I’m looking forward to celebrating this special day with you! There are many fun activities happening throughout King-Vaughan this year, I hope to see you there! Added May 31, 2018 from Deb Schulte MP. 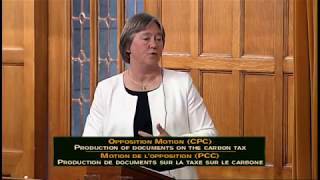 Deb rose in the House to recognize the E-petition to strengthen and modernize the Canadian Environmental Protection Act (1999). In just a few short weeks already 10,000 Canadians have signed on! Added May 24, 2018 from Deb Schulte MP. 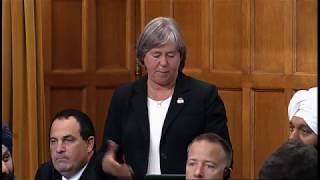 Deb rose in The House to acknowledge the #RepsAgainstHunger Campaign, a Food Banks Canada initiative in which elected representatives are asked to raise awareness about hunger in their communities. Added May 11, 2018 from Deb Schulte MP. 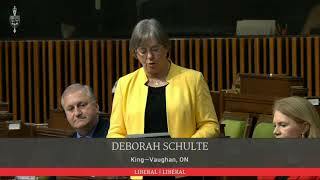 I rose in the House to thank the students of Nobleton Senior Public School for recognizing #MentalHealthWeek, an initiative reminding students of the importance of a school-life balance. 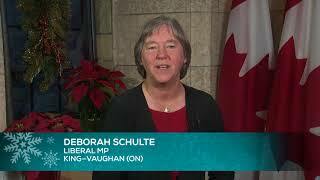 To the Grade 8 class of Nobleton Senior and to the classes visiting Parliament this year, bienvenue and welcome! Added May 9, 2018 from Deb Schulte MP. 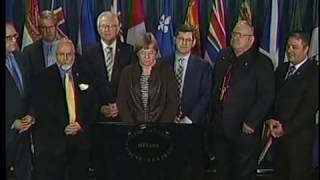 Climate change is already costing Canadians over $1 billion dollars per year in insurance claims, and will continue to negatively impact our farmers, our businesses and our communities. 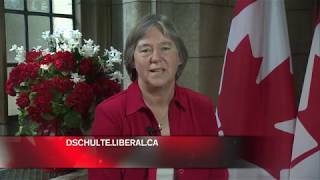 Canadians know that the time to act is now. Our government has a plan, and we are not wasting any time putting it into action. 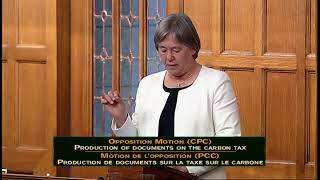 This week Deb rose in the House to speak about the importance of implementing a carbon pollution pricing system. Half of the global economy is putting a price on carbon because it is the most effective approach to reduce carbon pollution that is threatening climate stability around the World. 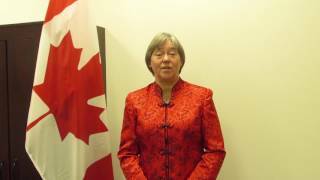 Canada is well placed to benefit from a transition to a low carbon economy. 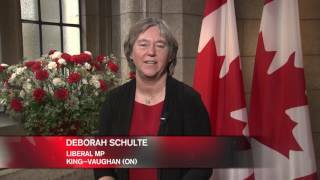 Added February 26, 2018 from Deb Schulte MP. Deb rose in the House to recognize the great work being done in our communities to support those living with developmental disabilities. Through our National Housing Strategy we will be supporting the creation of even more supportive housing opportunities like those being offered by the Reena Foundation, Intentional Community Consortium and Community Living - Toronto. 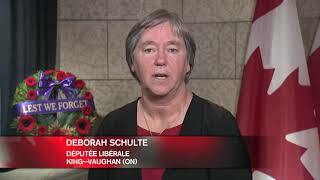 Added February 15, 2018 from Deb Schulte MP. 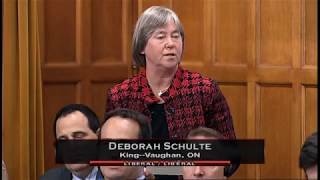 Deb recognizes the Lunar Year in the House of Commons and thanks community groups in King-Vaughan for sharing their rich heritage and cultural with Canadians. 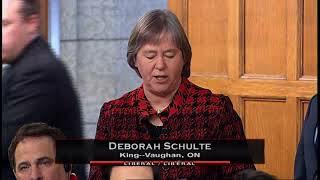 Added February 6, 2018 from Deb Schulte MP. 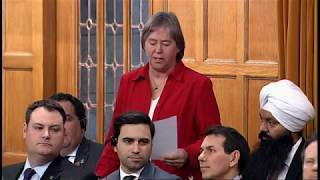 I had the opportunity today in QP to ask the Minister of Crown-Indigenous Relations and Northern Affairs about the important work the Government is supporting in our Northern communities to address the very real and negative impacts of climate change. 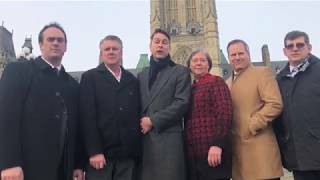 Added December 12, 2017 from Deb Schulte MP. 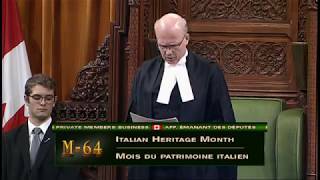 As Chair of Standing Committee on Environment and Sustainable Development I am very proud of the report that we tabled last week that makes 17 recommendations to ensure better protection of our heritage. 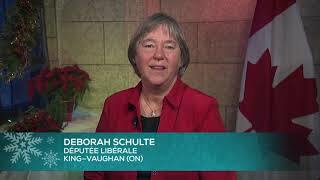 Added December 10, 2017 from Deb Schulte MP. Added December 8, 2017 from Deb Schulte MP. 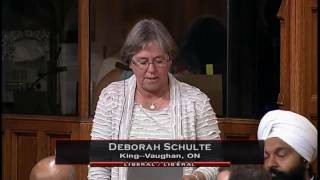 Deb rose in the House to ask the The Honourable Kirsty Duncan Minister of Science about findings in a report on the state of fundamental science in Canada, which highlighted the need for increased equity and diversity in our research climate. Added November 25, 2017 from Deb Schulte MP. Despite the many successes women are achieving, Deb rose in the House to recognize that there is still much to do to ensure equality and safety for women and girls. This week we begin 16 Days of Activism Against Gender Based Violence with the International Day for the Elimination of Violence Against Women. It is important that we remember that gender based violence disproportionately impacts women of marginalized communities. 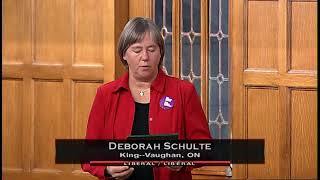 Deb urged that we all take action towards creating a world where ALL women are free from discrimination and violence. Added November 10, 2017 from Deb Schulte MP. As we observe a moment of silence this November 11, let us all take a moment to remember the sacrifices of all those who have served our nation. As Canadians, we come together on Remembrance Day to recognize the generations of servicemen and women who dedicated themselves to defending our freedom and preserving peace. 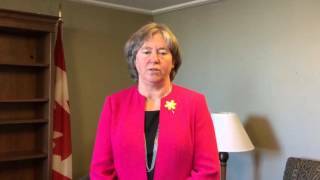 Let us also recognize those Canada’s armed forces personnel who are presently serving in conflict zones throughout the world, and their families. Added November 8, 2017 from Deb Schulte MP. I was delighted to be able to recognize the Ahmadiyya Muslim Jama'at Canada for its "Muslims for Remembrance Day" campaign, showing support for the sacrifices of Canada's armed forces and honouring those that paid the ultimate sacrifice. Poppy donations will go to the Royal Canadian Legion. 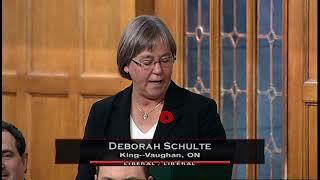 Added October 25, 2017 from Deb Schulte MP. 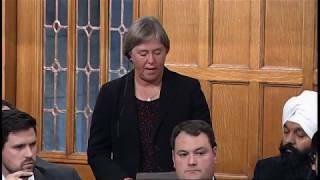 Deb rises in the House to recognize the 2nd annual Energy Star Day and asks the Minister of Natural Resources to recognize the positive contributions the program provides in Canada for our environment and the economy. 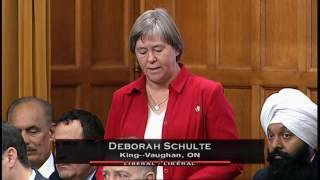 Added September 25, 2017 from Deb Schulte MP. I rose in the House to recognize the vibrant multicultural community of King-Vaughan and all the wonderful celebrations that we have recently held. Eid Mubarak, Happy Navratri, Shana Tova! Added August 1, 2017 from Deb Schulte MP. 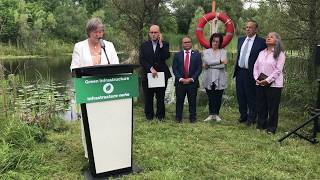 Vaughan, July 28, 2017 - Deb announced that six projects in Vaughan will receive funding under the Government of Canada's Clean Water and Wastewater Fund (CWWF). This is in addition to 28 other projects in Vaughan that were previously approved under the CWWF. 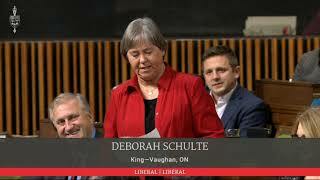 On this very special anniversary for Canada, I want to wish everyone in King-Vaughan a very Happy Canada Day! This sesquicentennial celebration is a great time to gather with family and friends to create special memories that will last a lifetime. 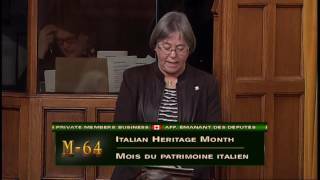 Hear what other MPs had to say about my Private Members' Motion, declaring June National Italian Heritage Month. 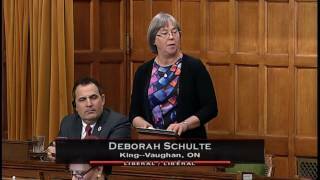 On May 17, 2017, Deb's Motion M-64 was passed by a vote of 289-0! 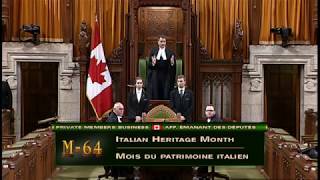 As a result, National Italian Heritage Month will be celebrated every June across Canada. 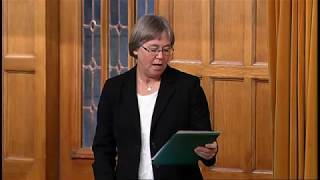 The second hour of debate on M-64, Deb's Private Member's Motion, took place May 17, 2017. 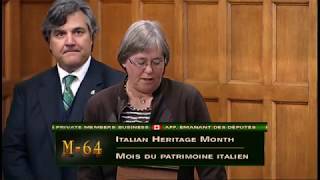 Once passed, M-64 will designate every June, National Italian Heritage Month. 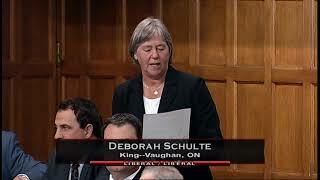 Deb honours in the House of Commons the six million Jews killed during the Holocaust. 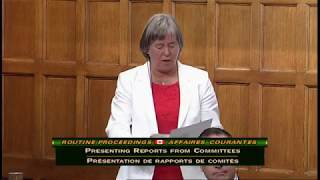 On March 24, 2017, the House of Commons Standing Committee on Environment and Sustainable Development presented its report 'Taking Action Today: Establishing Protected Areas for Canada’s Future'. 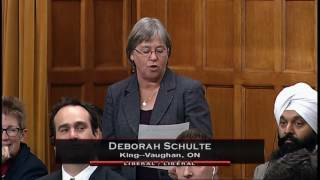 MP Schulte spoke in the House of Commons on March 22 about Ms Ferrara's work advocating for seniors through Pine York Seniors' Club and the Seniors Association of Vaughan Initiative (SAVI). 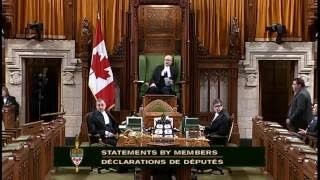 It was my pleasure to speak in the House of Commons in support of fellow Liberal MP Marc Serre's Private Member's Motion. 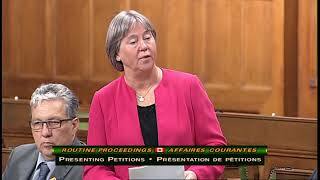 This motion, if passed, seeks to improve the quality of life for all seniors across Canada. From my family to your's- Kung Hey Fat Choy! Happy Canada Day to all! However you plan on celebrating, please take this time to appreciate how fortunate we are to live in a country that has built its national identity based on diversity, generosity, and resourcefulness. Canada lost one of its most influential aviation pioneers, George Neal. Mr. Neal learned to fly in Toronto in 1937 and was employed at de Havilland Aircraft (DHC) until enlisting in the Royal Canadian Air Force (RCAF) in 1941, where he became a Flight Commander and Chief Test Pilot. In 1946 he rejoined DHC and became Chief Test Pilot flying such Canadian iconic aircraft as the Beaver, Chipmunk, Otter and Caribou. He was a winner of Canada’s most prestigious aviation award, the Trans-Canada (McKee) Trophy in 1989, as well as being inducted into the Canadian Aviation Hall of Fame in 1995. In 2015 Mr. Neal was recognized by the Guinness World Records as being the oldest active licensed pilot, flying his own aircraft at 96 years old, when he flew his Chipmunk from Brampton to Pearson. I had the opportunity to work at de Havilland Aircraft in Flight Test when he was Director of Flight Operations, where he was a legend even then. His legacy will live on in our hearts and Canadian history. 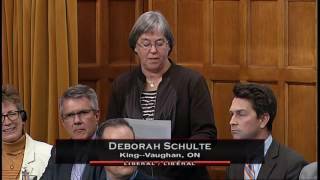 It was my pleasure to speak in the House of Commons on Budget 2016. This budget is about people: a transformative plan for investments in our families, communities and in Canada. On May 31, I rose to speak on this disease which impairs the body’s ability to get rid of excess iron, which can cause very serious and sometimes fatal conditions, including liver disease, heart disease, diabetes, arthritis, mental illness, and cancer. From my family to yours, chag Pesach sameach!